This spicy vegan pitbull is made of grilled seitan, enriched with Royal Kombu flakes and chipotle. This plant-based hotdog will make you roar! Finally. 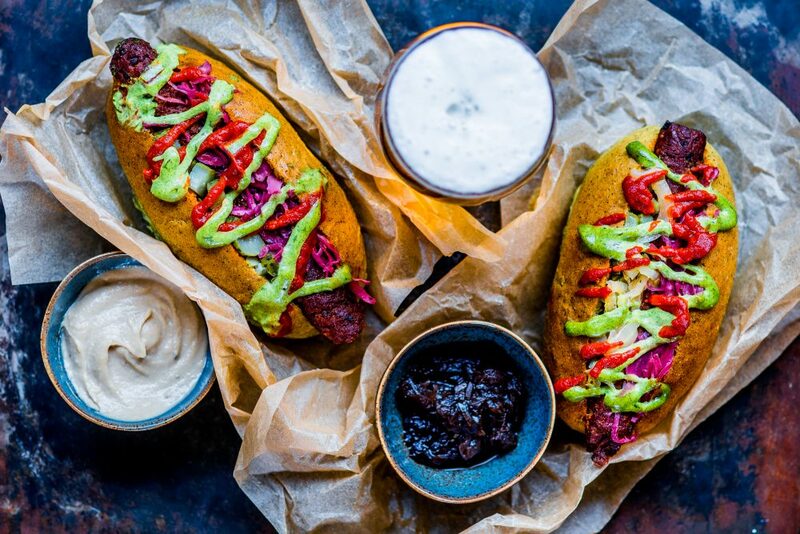 A really tasty plant-based hot dog and with all of its colors a feast for the eye as well! This vegan pitbull is made of grilled seitan, enriched with Royal Kombu seaweed flakes and chipotle: some oomph thanks to the smoked jalapenos. Best served on a Weed green Bun with killer toppings like red sauerkraut, pickles, fried onions and topped off with a Spicy BBQ sauce and an unbeatable homemade Green Algae Mustard. At least that’s how we roll in The Dutch Weed Burger Joint. Go ahead, dig your teeth in this baby. RAWR! The Dutch Weed Dog is entirely palm oil free, vegetarian, vegan, kosher and halal. Virtually everyone can enjoy them! We’re continuously working on optimizing our entire production cycle to make our products as sustainable as possible. EAT WEED LIVE LONG! It’s seaweed, bro. You won’t get high on our cookies. So is it okay with you if we use them on this website?